Why is booze business against legal pot in Massachusetts? 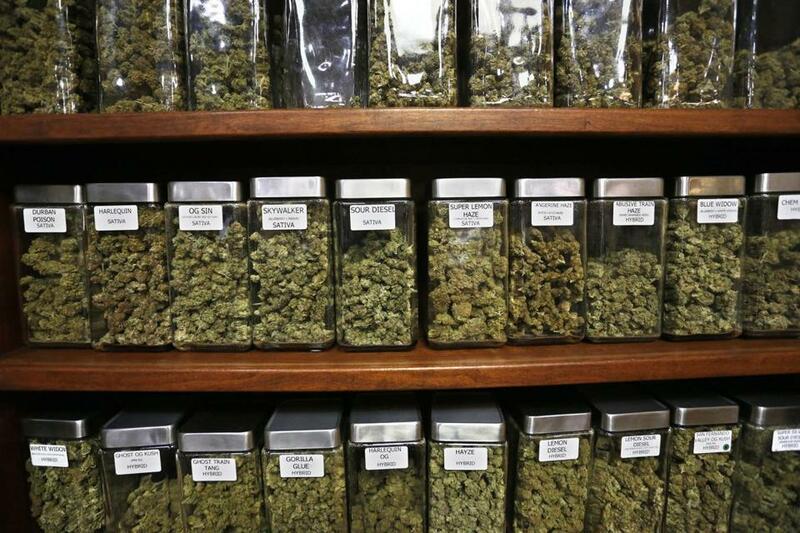 Glass containers displayed varieties of marijuana for sale on shelves at a dispensary in Boulder, Colo. The state’s alcohol industry has emerged as a big donor in the campaign against the legalization of marijuana that goes before voters on the November ballot. The Beer Distributors of Massachusetts and the Wine & Spirits Wholesalers of Massachusetts combined to donate $75,000 of the more than $600,000 raised by the anti-legalization Campaign for a Safe and Healthy Massachusetts as of early October. The basis of their opposition, however, is unclear. The two groups, which represent companies that supply bars, restaurants, liquor stores, and other retailers, did not respond to repeated requests for comment on their donations, and the campaign that received the wholesalers’ money said it does not know why the two group donated. The donations suggest the alcohol industry is worried the legal availability of pot will cut into booze sales — except that hasn’t turned out to be the case in several states that have legalized marijuana. 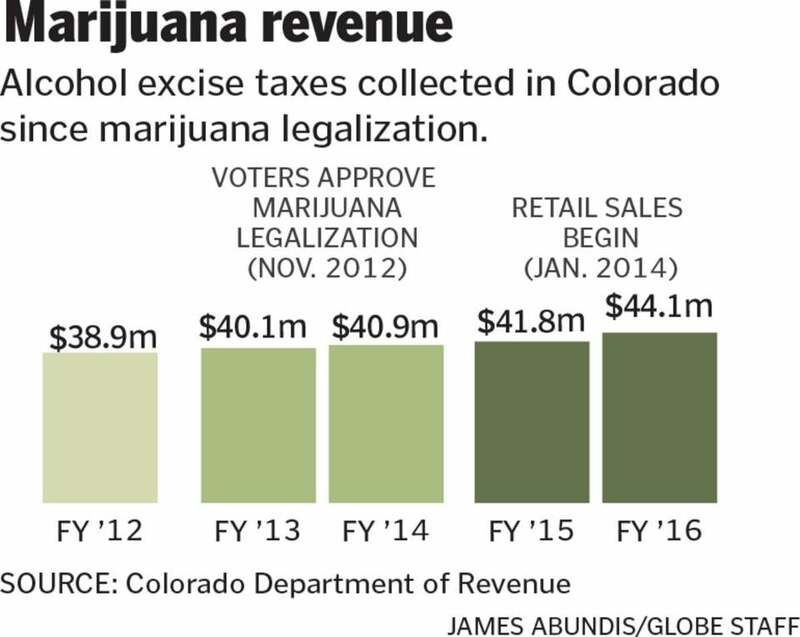 In Colorado, tax revenues from the sale of alcohol have increased every year since voters legalized marijuana in 2012. And several industry groups say they’ve noticed little effect on business. Steve Kurowski, a spokesman for the Colorado Brewers Guild, agreed. “People are moving to Colorado for many different reasons, so we have not seen a direct effect from legalized marijuana taking or adding to sales in our state,” he said, adding that cannabis-related tourism to Colorado may boost beer sales. In Washington state, alcohol tax data is skewed by changes in state taxes and liquor laws since the state legalized marijuana in 2012. But, “all we’re seeing is increased sales” of alcohol since then, said Rick Garza, director of the Washington State Liquor and Cannabis Board. Yet at the street level, the perception that marijuana could hurt sales of alcohol persists. In the small Colorado city of Gunnison, Bob Leach, owner of Gunnison Liquor Store, said sales are down this year after increasing in the early days of legalization. He’s not sure why, but assigns some of the blame to legalization. “If I had to jump one way or the other, I would say it’s going to hurt my business,” he said. And some researchers believe that pot legalization will still eventually hurt alcohol sales. A report issued in September by Cowen and Company, a financial services firm, said that even though the alcohol industry has been “insulated from cannabis thus far,” legalization’s impact “will become increasingly apparent.” The report suggested that while alcohol drinkers are more likely to use marijuana, pot consumers are less likely to drink. In Massachusetts, Jim Borghesani, a spokesman for the pro-legalization Yes on 4 campaign, said the potential impact on the alcohol industry is immaterial to the debate on marijuana legalization. Corey Welford, spokesman for the opposition campaign, said there has been “no contact between the industry and the campaign.” Moreover, Welford points out the pro-marijuana side gets much of its $3.7 million raised so far from pot-related interests, while his campaign has broader support, including donations from health care and hospital groups, and a political action committee that supported Governor Charlie Baker, who opposes legalization. Casino magnate Sheldon Adelson and his wife have also donated $1 million to the pot opposition; she is a physician specializing in addiction issues and the couple have long been involved in anti-drug causes. The opposition has raised about $1.7 million in total so far, Welford said. “We are fully transparent about where our contributions come from and our campaign is focused on making sure people understand the consequences of legalizing commercial marijuana in Massachusetts,” Welford said. Prior to this year the alcohol industry did not get involved in many state-level campaigns for the legalization of marijuana. The exception was 2010 in California, where the state’s beer distributors contributed to the campaign that defeated a legalization vote. But this year, an industry group donated to the opposition to legalization in Arizona, while in neighboring Nevada, alcohol distributors have supported the pro-pot side. That may be because, unlike Arizona and Massachusetts, the proposed law in Nevada would allow only licensed liquor wholesalers to distribute marijuana in the state during the first 18 months.